Liquitex professional palette knives and painting tools are a perfect match for any artistic application. The range of 18 knives encompasses innovative and unique large shapes and sizes to suit a variety of techniques. I purchased three of these knives very recently and the first thing that hits you is the size, they really are quite large and although the metal is relatively thin it is well tempered and capable of the job in hand. 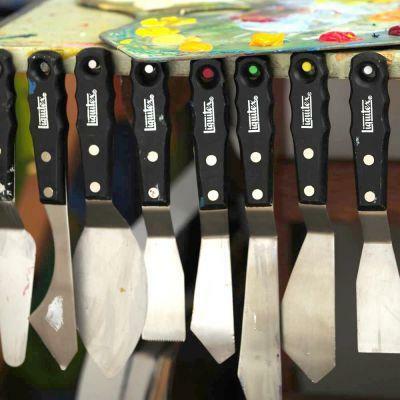 I consider these to be very good knives especially if you are undertaking larger works and for mixing quantities of paint. The handles are very comfortable to work with and are firmly joined to the handles. Good to have the length of the knives, but would have liked to have had the width of them.